Nautical accents perfectly encompass the essence of summer, which is why I've been on a perpetual hunt for all things nautical ever since winter ended. From sailboats to anchors, nothing screams salt life like a fabulous nautical print. The latest addition to my growing collection, are these adorable anchor pendant beaded bracelets, which were too cute not to stack on together. 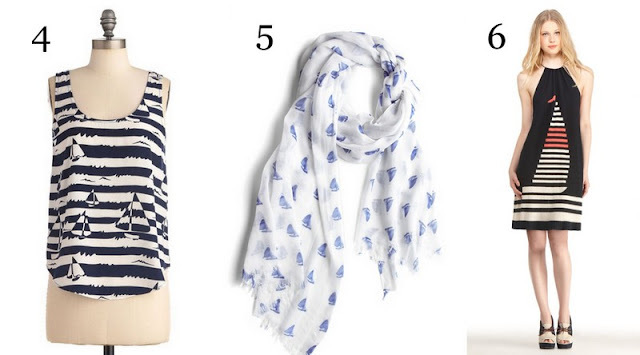 Looking to add a few more nautical prints to your wardrobe? Below are some of my current crushes. Another fabulous look, Anna! Love the sweater :) And you always have the best accessories! I am such a huge fan of your blog! Thank you for being such a inspiration for amazing outfits! OMG how sweet is that sweater! Beautiful skirt and sweater! You have a perfect taste in fashion! omg the starfish-ring is sooo cute! Especially adore the anchor sweater and skirt! really cute outfit. 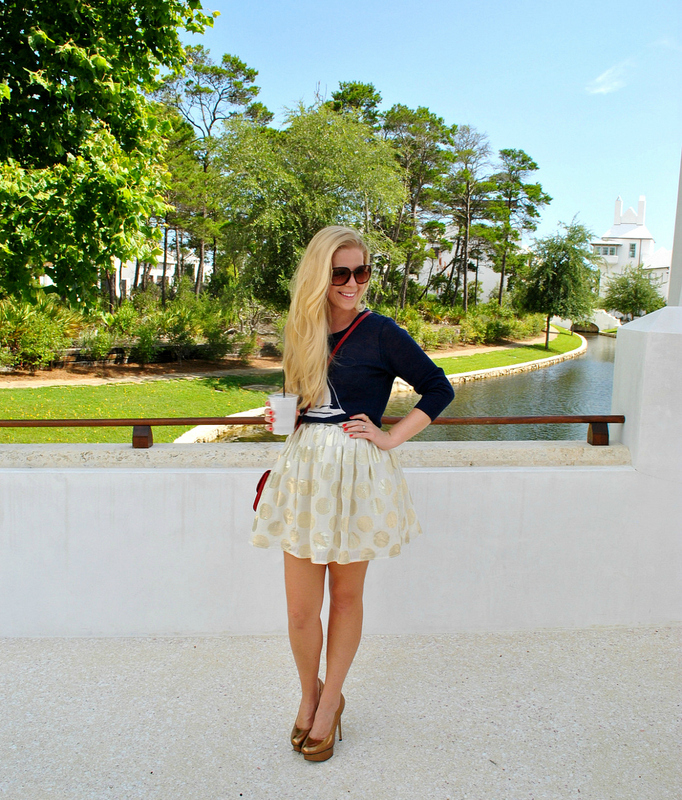 Love that pretty dot skirt. Looks amazing. I love nautical details...besides that blue, red and white are one of my favorite color combination and perfect for summer! So sweet! Love the nautical mood here, you look adorable and so ready for summer! So cute <3 I used to wear a navy dress when I was younger. Loved it. Nautical is always the theme of the Sumer. I love it! I love your sweater, it's so adorable! Beautiful nautical look on you. I love the sweater and the arm candy. What an adorable nautical outfit! I love the bracelets. Girlllll I LOVE this fun, nautical look! The skirt is unexpected but adorable and it really works! loving the cute bracelets!!!! Great outfit. All of the accessories are way too cute! That skirt & sweater combo is so adorable! You definitely accomplished the nautical look with the anchor arm candy and sailboat sweater!! Love this!! Happy July 4th! Amazing outfit im in love!!! Just found your blog its so amazing!!!! Lovely nautical inspiration! it exudes summer and is a perfect blend of red and blues for the holiday. Happy 4th of July Anna! Oooh!! I love me some nautical! It's just classy and it makes me feel like a Ralph Lauren or Tommy Hilfiger commercial! Gorgeous.. Happy 4th! I love the touch of gold, it really brings a whole other dimension to the nautical look. I loooove this whole nautical outfit! SO cute! Super cute Outfit. U Look Great as always. The colors work perfectly with the 4th of July coming up, simply perfect! This sweater is adorable! You look absolutely incredible! I love a nautical look, and your sweater and skirt go so well together! I'm actually going to a nautical-themed 4th of July BBQ tomorrow and need to put something together... I'm sure my outfit won't look nearly as cute as yours! LOVE this outfit! I'm dying over the cute skirt. 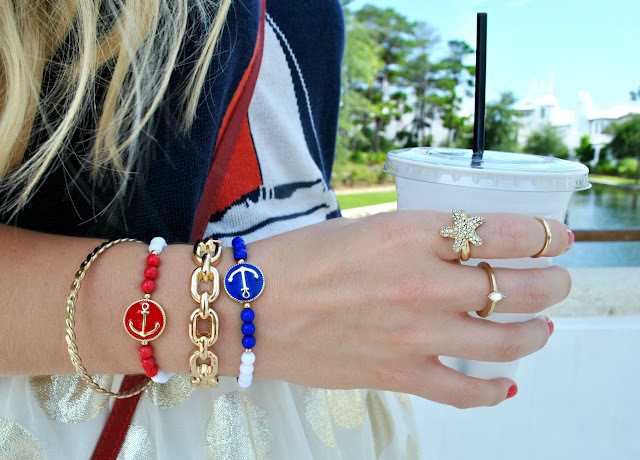 I'm obsessed with anything nautical in the summer so this post is my jam! Love this outfit! Those bracelets are adorable and I'm obsessed with those heels! Super cute outfit, your top is too cute! 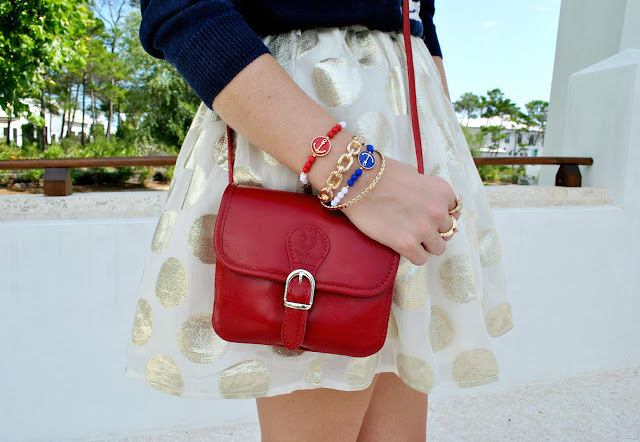 I love this nautical look, especially with the skirt as a balance! Adorable! That sweater and the bracelets are so cute! Festive, but not too much! Cute Cute sweater! love it! Such a cute skirt! Love the gold polka dots! The more time I spend in New England, the more nautical my style becomes :) Seriously ADORE this look on you lady, and I am fully obsessed with that sweater! Also loveee how yu mix it with a glam skirt-- I need to get better at mixing and matching my nautical pieces! I love this outfit, especially that sweater. It's lovely. Oh, and I read the "about me" section and you really inspire me! I have big dreams about making it to the fashion industry, I've been dreaming since I was a little girl to attend to a fashion school when I'm older and learn from the best, and you truly inspire me so much! Following your blog now <3 Just wondering do you have a bloglovin account? Seriously love this outfit! The color combo is perfect! I am loving all of your jewelry with this outfit! That is such a cute look! I love the big, gold, polka dots! Perfection!